The kettlebell lifting history in the USA closely bound with Valery Fedorenko's arrival to the USA. Valery arrived to the USA in 1999 especially to develop kettlebell lifting and make popular this kind of sport just then he brought the kettlebell with him. That time nobody could hear anything about kettlebell lifting all the more about kettlebell. There was no information even in Internet. The first exhibition performances started in July, 2000 in New York, at Brighton Beach. This show impressed the audience because kettlebell lifting means large muscles but as far as kettlebell lifting for large quantity means force durability the kettlebell lifters of a high level should look correspondingly. Then Valery continued holding its exhibition performances. 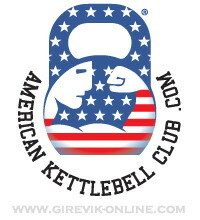 In 2004 American Kettlebell Club was established where the club system with coaches training was introduced. Since 2006 American Kettlebell Club started annually take part in the Arnold Classic Festival. In 2008 American Kettlebell Club hold competitions at this Festival on kettlebell lifting in 32 kg (one arm press) where more then 600 persons took part in. The first Masters of Sport became Catherine Imes and Marty Farrel. The quantity of sportsmen involved in kettlebell lifting in the USA is increasing in geometric sequence. To the present time in American Kettlebell Club the quantity of Masters of Sport and candidates for Masters of Sport is constantly increasing, as well as MSWC appear. Now there are a lot of kettlebell lifting clubs in the USA. A lot of competitions of different levels are held. American Kettlebell Club instructors work all over the world by developing international kettlebell lifting!